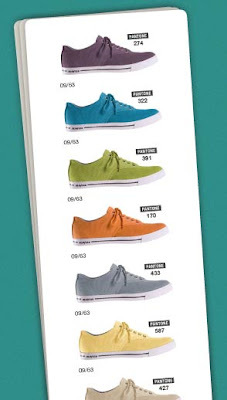 [BB-Blog]: SeaVees / Pantone sneaks. Normally I have zero interest in shoes, but these definitely appeal to the design geek in me. With the creation of the 09/63, SeaVees celebrates the founding of Pantone, and the release of the first PANTONE MATCHING SYSTEM in September 1963. For the first time in their 45 year history, Pantone has allowed an external design team into their hallowed archives. SeaVees has selected seven vintage colors from the original Pantone color guide. The palette, chosen from the only authentic guide known to exist, epitomizes the cool, casual style of California in 1963. The series production has been restricted to 1,963 pairs.